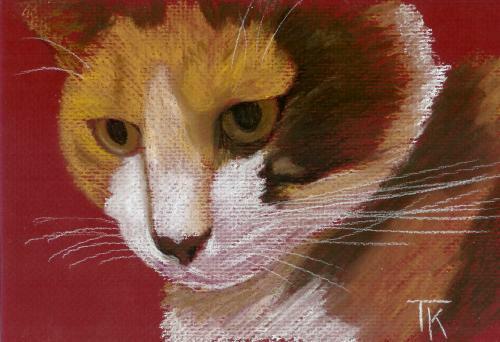 Click on Heidi to enter my art site. If you have a comment for If You Care, you can leave it at their web site. Maybe you have a thought for Sierra Magazine, which ran this ad in their Nov/Dec 2015 issue. …about some, but not others. 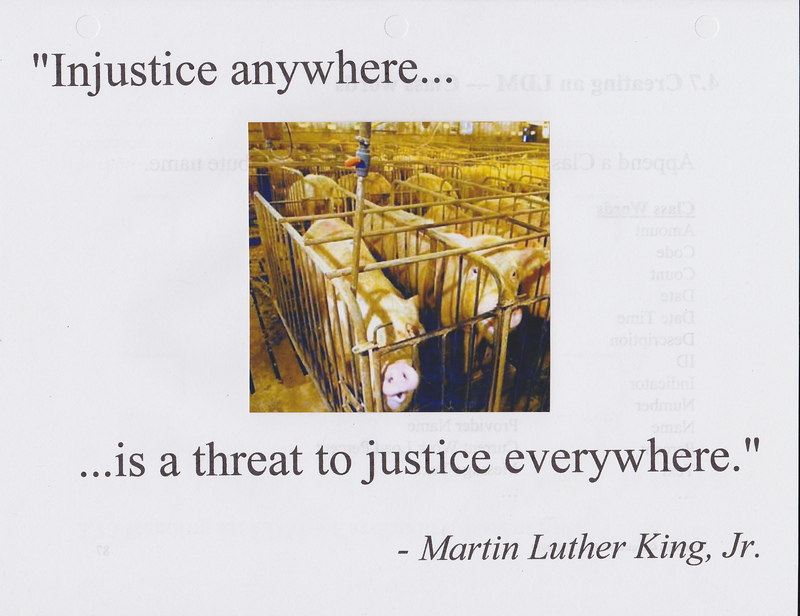 I would normally be eating breakfast right now, but since I am Fasting Against Slaughter today on World Farmed Animals Day, it seems like a good time to write. Two tasks I’ve been doing for an Animal Rights group lately have made me ponder. I’m organizing the large number of issue flyers we bring to tabling events, and responding to messages for help for animals via social media. We can refer people to animal rescue organizations and hope for the best, but we are an educational org and don’t do hands-on rescue. It is heartbreaking to feel so helpless in the face of the real-time suffering people bring to our virtual doorstep. But as I told a recent correspondent regarding farm animal abuse that she witnessed, rescue is mopping up the mess that meat makes. And isn’t that true of most of our brochures? “What’s wrong with…” Leather & Wool, Circuses, Dog Fighting, Fur Trim, Dairy, Cage-Free Eggs, Devocalization. This display rack represents a small portion of the mess that speciesism makes. I was thinking this morning that attacking this multitude is like a game of Whac-a-mole, but that is a violent analogy I would prefer to avoid. So instead let’s talk about dikes, as in the little Dutch boy trying to stop a dam leak with his finger. To me this metaphor means that one person can make a difference, but it’s not a good long-term strategy, much less a permanent solution. I like this analogy with Animal Rights, because behind that dike is a body of water, and behind all the exploitation is speciesism. With the pressure of speciesism present, the only thing holding abuse back at all is human decency, and that is pretty darn leaky. Now, once we look over the dike at the bog*, maybe we start thinking that the real solution is to drain it. This means that instead of talking about making cages a little bigger or even not eating chickens, we can speak generally about our underlying assumptions about animals that define how we relate to them. Speciesism. After we’ve been working on that for a while, we notice that this bog has other dikes on it, and we wander over to see how they’re holding up. Just as leaky, and the victims getting drenched all around the bog are other races, other genders, other sexualities, other abilities. The bog turns out not to be speciesism, but the general belief that some lives are worth less than others. What is the word that encompasses all the ways that people decide others are not as important as themselves? Let me know what you think – I’ve been looking for this word that links all these assumptions. This is more bizarre than usual – I’m suspicious of what BowWow BBQ might be. “We are focused on those suffering outside our dike,” is the reply. “Those outside your dike are not as important. Everyone knows that, so if anyone heard your suggestion, they would be offended that you think so little of this dike that you compare it to that one.” Or, “We need to solve this problem first. After we’ve bailed this side of the bog completely dry, maybe we can bail your side.” So they continue to throw the water towards your end of the bog, and you wonder in what way these bailers, who rank the value of lives according to degree of perceived difference from themselves, differ from those who have filled the bog in the first place. Who is filling the bog? *Disclaimer – I have nothing against real bogs, which are valued ecosystems. We should only be draining metaphorical bogs, symbols of stagnation, disease and decay. ** An example going the other way would be a sexist animal rights protest. There are lots of these. 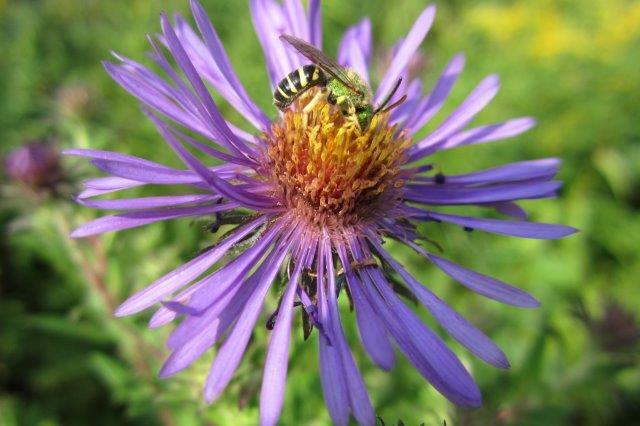 Native plants support native animals. but to face the issue clearly at hand. What I can’t do is not my job. My job is to do what I can do. What other people do is not my job. My job is to do what I can do. And I can show up with a table and some vegan and GMO materials, stand there a few hours and do my best to answer questions. This is not impossible. I thought about all this as I have spent many hours pulling and bagging invasive alien Garlic Mustard from woods by myself (with permission), and knowing I will have to repeat this for several years in each site before the seeds existing in the soil are all gone. I would look up and see a large area infested, but before I could lose heart, I looked down at my feet and said to myself, “That area is not my job. Next year is not my job. This right here within my reach, this is my job right now. Now it’s this plant. Now this one.” I would think about the relief the remaining, native plants will have with this individual allelopathic poisoner gone, and the relief the animals who live here will have when a co-evolved native plant of use to them can flourish. After a while I looked around and the area was cleared. This year. My son thinks I’m nuts with a goal of eventually clearing an entire woods, but I see no contradiction in attempting the seemingly impossible. I can’t rid the continent of this disruptive pest by myself, but as long as I have sufficient health, and as long as I care, I can pull that one. And now it will never seed. I tutor inner city elementary students, mostly immigrant refugees, a few hours a week. Will I solve our country’s education crisis? That’s not my job. One week my task was to show 40 kids, not all of whom speak English, how to use a protractor. Done. In analyzing what is my job, two aspects to consider are, 1. are my efforts efficient and useful?, and 2. what do I do with failures? Each plant pulled, each person spoken to, each person who sees me rejoice in my vegan life. Was I solving animal and consumer exploitation at that tabling event? No. That is not my job. Was I making a difference? You betcha. Will you join me? Please consider volunteering for any organization which is striving to make the world a better place, one action at a time. Wesleyan U. 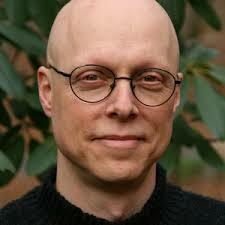 Social Psychology Professor Scott Plous studies people’s attitudes towards using animal products. I’m taking his intro to social psych online course and we had to participate in this interesting survey. I plan to read his research, but this survey shows you what the front end looks like (at least part of it – your answers determine what further questions you get, like a “Write your own adventure.” It’s open to the public, so give it a try, help Prof Plous figure out what’s going on. 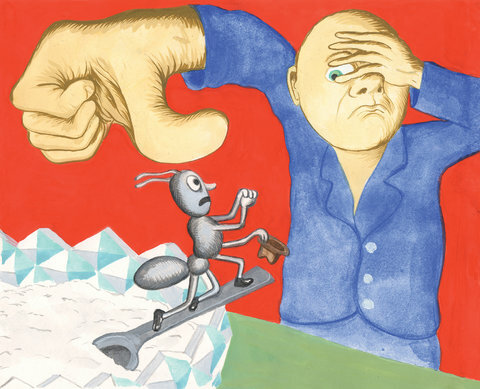 I think this book excerpt from The N.Y. Times, “On Smushing Bugs,” is just beautiful. All beings tremble before violence. Then whom can you hurt? What harm can you do? But mostly I love his humility, his questioning, his looking deeply into himself, looking for the truth no matter where it takes him, even to a cliff or dead end of choices he doesn’t want to make. This isn’t a how-to essay, and claims only to ask questions, not answer them, so he doesn’t mention that prevention adds a choice between re-washing all your dishes every day or pulling on your executioner’s hood. I must admit to mixed results with prevention. But maybe we don’t need all the answers right away. Maybe looking, within and without, is the path to figuring out how we want to be in the world. Mr. Feld says they’re reacting to the changing public mood. Thank you to everyone who told him what you think of Ringling’s use of elephants. I’m in the local AR group Animal Rights Advocates of Upstate N.Y. We just re-launched our website, arauny.org, with a schedule of local writers contributing to our blog a few times a week. Check it out and subscribe by email or social media for updates. 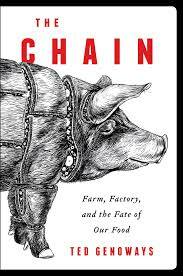 I just read half of The Chain: Farm, Factory, and the Fate of our Food by Ted Genoways. It seems well-researched, and though I personally found the history of slaughterhouse labor unions tedious, that does explain how we got the system we have. Having read Fast Food Nation years ago, much of the material was not new to me. I expected this book would explore the social justice issues around Big Meat, and I was hoping that would include justice for non-human animals. Halfway through, I seemed to have already passed the chapters dealing with inhumane treatment, and it became pretty clear that this author is only appalled by a factory killing 13,000 pigs a day in that it is unsafe for workers and consumers; as long as we can stop workers from beating or sodomizing the pigs (doubtful), he seems more-or-less OK with the pigs lives and deaths. I have all compassion for the workers, both American-born and immigrant, and am grateful that their story is being told, and I greatly appreciated the paragraph that found compassion even for abusers, caught up in the system themselves. From other reviews, however, it seems as though I am justified in putting down the book, that I would read in vain for even a passing thought given to asking: Is this system not working because it’s big and fast, or because it’s inherently, *inescapably* violent. For example, the author indicates understanding that, when you have to move a mother that has been immobilized in a cage no larger than herself for months, and she finds it difficult or painful to walk and doesn’t want to, you have to make her, and that probably means hurting her. He seems satisfied that as a result of being caught abusing pigs while moving them, the business decided to move pigs less. So… the solution to crippling animals by not allowing them to move is: to keep them from moving even more. What he doesn’t mention is that, on top of the obvious cruelty of immobilizing an animal even longer, the pigs do have to move at least once, to the truck and off the truck to slaughter, and that is where a lot of abuse happens, for exactly the same reason: crippled, terrified pigs. But he never makes the connection that we have another choice. I didn’t expect this to be an animal rights book, but there was no acknowledgement of this choice, and the omission was glaring. This author is subtle, and often seems to let the facts speak for themselves rather than editorializing, but while you can often infer his discomfort with certain things, there is no hint given that he is not 100% comfortable with the killing. Violence is arguably never useful, and in this case, it’s so unnecessary, so transparently frivolous: Spam. I was hoping that a compassionate author would make this connection, and my disappointment is why I didn’t like the book. Would you want to finish a book about injustice written by a racist? Perhaps an investigation on how difficult life in the southern slave states was for the poor whites, a book which only seems to be bothered by slavery if there’s beating involved? Being a non-speciesist, that’s how I felt about this book. An animal rights organization I’m in was invited to participate in a Human Rights Day program, organized by Rochester Human Rights Committee, whose website is almost as out-of-date as ours. The program was fantastic, and very well organized. I’d estimate 200 people attended. And check out their event image, which totally includes animals in every way! One of the speakers, Paola Macas Betchart, indicated she hoped to speak about Nature Rights that had been added to the national constitution of Ecuador. Unfortunately I had to leave before she said any more about it. I tabled, which means I sat and handed out leaflets and talked to people. To prepare I made a poster about injustice. Speciesism is discrimination against nonhuman animals based only on their species or irrelevant characteristics. What would be the relevant criteria here? Most would say it is whether animals have their own interests, and can feel pain. What does science say about whether animals meet these criteria? It says, resoundingly: Yes, they do. Actually, science says many animals do. And many humans don’t (such as infants or the cognitively-impaired). So if we don’t offer rights to animals that do have these qualifications, and we don’t strip rights from humans who don’t, we are not deciding based on relevant criteria but merely favoring our own species. a preference for those who are like us? the details considered (such as skin color) are irrelevant to the rights refused (such as freedom from slavery)? Our culture is so conditioned to think of animals as ours to use however we want, that it can be difficult at first to consider speciesism as wrong. 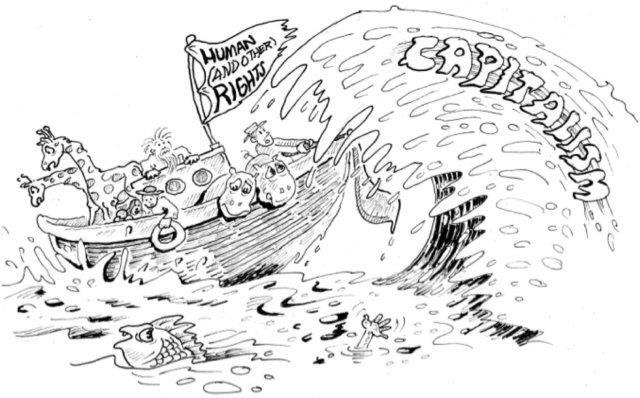 It has always been challenging for people living in biased cultures to break free. But it is being done right now. Alongside people who are trying to eliminate racism and other biases, are people trying to eliminate speciesism, in their own lives and in their culture. Actions against all these biases complement each other, because the root is the same: ignorance about those who seem different. Veganism is the first step, a moral baseline for those who reject speciesism. Veganism includes non-participation in any exploitation of animals. This and other actions we take, such as protecting habitat, supporting legal rights for animals, or reconsidering our speech, can express our respect for all our fellow creatures, and help to build a more just world. Veganism is a moral and ethical way of living. It is the practice of non-cooperation and non-participation in anything that exploits nonhuman animals, humans, or the environment. It is a moral baseline for our conduct and how we are revealed to the world. With understanding that it is normal and natural to have many different reactions to this news story, but that we can choose which paths to follow, I wonder if anyone would be interested in my understanding of karma, which others here have been mentioning? If not, click delete. Nothing here is new, just hopefully clarity on a concept that is often muddled with several meanings, and how karma can work for us. By my understanding: Karma was originally Hindu, and that is the idea most modern people have of karma: divine justice, something (“the universe”) or someone who keeps track and evens the score. The Buddha, who lived in Hindu India, found this unhelpful because it didn’t allow room for change. He understood that even good people may have to suffer for their past harmful actions, but that they would be better off because of the good they were doing now (example: Angulimala) – pertinent to any of us who ever screwed up! Anyway, Buddhist karma can be seen in two lights: One is the ripple effect, that the kind acts or speech or even “vibe/energy” we put out, affects others and has a chance of coming back to us – we are making the world a better place, and that’s the place we live, so it’s better for us. Even if the effect is small, we are not making things worse. I think this is pretty evidently true. The second way Buddhist karma can be understood is that no matter what effect our acts have “out there,” they have done something to us on the way out. For example, loving someone who hates us is better than hating them, because we will be happier filled with love than with hate. I have found this “instant karma” to be true as well, and the effect will probably be huge, life-changing. So you see, Buddhist karma is more like a law of nature than a faith in justice. Celebrating accidental violence may fill us with a much-needed sense of satisfaction that the scorekeeper is on duty, but how does it impact us under the Buddhist understanding? What do we set into the world when we express gladness at others’ misfortunes (what kind of world are we creating), and what does this Schadenfreude (harm-joy) do to us on the way out? None of this is to say that a person struggling with feelings of joy is a bad person, just that an understanding of the harm it does to ourselves and others may be useful in letting it go. And we can choose to be glad that the man is not hunting right now, without being glad that it’s because he was hurt.